From The East — St. John's Lodge No. 11 F.A.A.M. Another cold month is behind us. Let's take joy in the education we received last month on Masonic Etiquette by W.B. Anand Trivedi helping to fuel our Masonic fires. Since then, a number of us have had opportunities to visit other lodges to support them and bring awareness of St. John's Lodge No. 11 and its planned activities. I invite everyone to take part in the forums (Slack, Facebook, etc.) and be active, not only within our Lodge and its activities, but with our Brothers at large. Sharing fellowship is one of the most important ways to strengthen the foundation of our Craft. Also, to improve in your Masonic knowledge, it is crucial to surround yourself with those who have that knowledge to share. So get out there and see what you can learn. Bring it back to Lodge so we all can benefit from your travels. In keeping with strengthening St. John's Lodge No 11, this month we will initiate two candidates into Masonry – another step in ensuring the future of our Lodge by bringing more good men to the Craft. Your participation in the degree in any capacity will make a long and lasting impression on the candidate and builds you into a better Mason. Our continued efforts to put on high quality degrees will not go unnoticed as we will have a Past Grand Master in attendance and a guest Worshipful Brother presenting the charge. Thank you to everyone serving on a committee this year. We have a lot of efforts going on, and I trust the goals set will challenge us to work hard and further improve the operations and future of our Lodge. Full Trestleboard available here. More info here. Although the winter so far has been cold, fellowship in and around St John's Lodge No. 11 is just warming up. Last month we witnessed the installation of 2018 officers. A generations old ritual where the light of Masonry is passed onto others who will take the Lodge in charge and fortify its foundation so that future generations can enjoy all the Craft has to offer. Thanks again to W.B. James Parkhurst, Past Master, for his service to the Lodge and his continued support. Since our last meeting, some of us were able to attend the installation of officers at Anacostia Lodge No. 21, who we will be strengthening our bond with by joining our multi-lodge picnic effort this summer. They have offered to do a joint table lodge with us which will be fun for all who can attend. This month, W.B. Anand will be hosting a Masonic etiquette program that will help to answer some of the most common questions and concepts many new brothers have. We have much to learn this year as we grow in knowledge and extend our hands out to other lodges and the community around us. I look forward to a busy and prosperous year filled with education and fellowship with you all. Happy holidays and Happy New Year! I hope everyone is enjoying their holiday season and have found this time to be enjoyable and relaxing. As you all know, we did not have a stated communication in December due to a special communication called by the Grand Master that fell on our meeting date. Unable to settle on a day that worked for all those necessary to be installed as officers, you are again hearing from me, From the East. It appears that the Grand architect has plans for me to serve the lodge just a little bit longer, which I did not expect following my early transition into the position. But hey, I’m glad to continue to serve the lodge in whichever way it calls upon! In early December I was lucky enough, thanks to blessings of the lodge who generously voted to pay my way, attended the Grand Lodge Annual Banquet. Which I am pleased to report was extremely well attended by our Brethren and their lovely partners. The food was delicious, the drinks were refreshing, and the fellowship was beyond wonderful. I hope that in the following years you all will decide to take an evening and spend it with our fellow DC Brethren in celebration of another wonderful year! Our next stated communication will be our installation ceremony and that will be open to all masons and friends and families. I believe even my mother and father may be in attendance! I hope that you will be there and help us bring in the new year with our new 2018 lodge officers and new Worshipful Master! Looking forward to seeing everyone in 2018! Have a wonderful holiday season! Greetings Brethren, and Happy Holidays! First, the Grand Master has called for a Special Communication of the Grand Lodge to be held on the evening of December 1st, the same night as our Stated Communication. Following the Grand Lodge Code, the Stated Communication for December is automatically called off. Since it is an imperative that members of St. John’s lodge No 11 are in attendance for that Grand Lodge Special Communication, we will not meet on Friday, December 1st. Since this Stated was slated to be the installation of Lodge Officers for 2018, we will be requesting dispensation from the new Grand Master, once he is installed, to install our 2018 Officers at the January Stated. Now, onto the fun stuff! One of my favorite times of the year is upon us. All the good food starts coming out and good memories are shared and made with the ones we love. Thanks to the Great Architect we are blessed with brotherly love and love for all our families and friends, and it’s important that we tell each other and our families how much they mean to us. So, I first want to say thank you to all the Brothers out there who take their obligation seriously and for being the men who we can always count on to reach out their hands to assist a fellow Brother or a Brother’s family. This fraternity has demonstrated to me that, if I am in need of support in any way, whether it be now, later, or sometime when I’m much, much older, I am happy to know my Masonic brothers have my best interests at heart. I’m proud to be a member of this Lodge and of Freemasonry as a whole, because I know that Brothers look out for each other first and foremost. So please, during this holiday season, take the time to share your gratitude with others and tell your loved ones you love them, it can never be enough. We have one final meeting of the 2017 year, and this open installation will be a spectacle. Bring your families and your friends and help us celebrate the transition and achievements of our Brethren. Congratulations to Brother Sam Chin, our Worshipful Master Elect, and to the rest of the elected 2018 officers! I’m greatly looking forward to next year and your leadership. I know the brethren have made the right decisions in their voting, and all of the newly elected officers will justify those decisions. Congratulations again everyone! Full Trestleboard available here. Remember: No December Stated Communication. 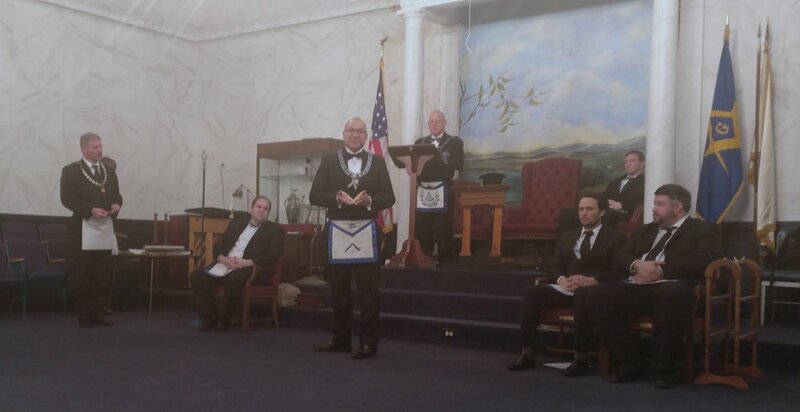 At our October stated we had the joy of raising five new Master Masons. I want to again congratulate and welcome (once again) Brothers Doctor, Motroni, Timbers, Lindo, and Smith to the sublime degree of Master Mason! I’m happy for each and every one of you and I’m proud to be part of your Masonic experience and growth. I hope that each and every Brother in the Lodge will help to make our new Master Masons feel welcomed, engaged, and encourage them to discover and learn all that this wonderful Fraternity has to offer. I would also like to remind everyone that at our November’s Stated Communication we will be taking steps to solidify our “officer’s line” for the 2018 Masonic year. Come and place your votes for next year’s officers! I am excited for everyone that has volunteered their service for the lodge, and on behalf of all the members of St. John’s Lodge I want to thank you for your service and dedication to ensuring the business of the lodge is kept in order and moving our initiatives forward. I for one am looking forward to electing our new Worshipful Master and having the privilege to soon my rest my bones in the comfy chairs in the North. We are coming to the end our Masonic year with only two meetings remaining; two very important and meaningful meetings with November elections and the installation ceremony in December. I encourage you all to invite your families and friends who may be interested in witnessing our installation ceremony. We have historically had our ceremony opened to the public so please bring along your friends and family and help us celebrate this transition. I also want to give a quick shout out to the degree team for their work they put in for the Master Mason Degree this past month. I thought it all came together very well and WB Trivedi crushed it as King Solomon, garb an all! Thanks again for all your hard work, let’s keep it up Brethren! In October, we will be conducting the Master Mason Degree and raising our Brothers to Third Degree. This degree requires a significant amount of memorization and prep- aration for those conferring the degree. I wanted to share with you something I came across while reading some Masonic literature regarding Masonic Retention. In doing so, I hope to draw your attention to the fact that the rituals and ceremonies we conduct are simply tools that we as Masons use to communicate a bigger picture about man, the universe, and our role in it. Please read the excerpt below originally written by Albert Gallatin Mackey 144 years ago. "One who commits to memory the questions and answers of the catechetical (sic: Relating to or consisting of asking questions and receiving answers by rote rather than by understanding) lectures, and the formulas of the ritual but pays no attention to the history and philosophy of the institution; is commonly called a Parrot Mason, because he is supposed to repeat what he has learned without any conception of its true meaning. 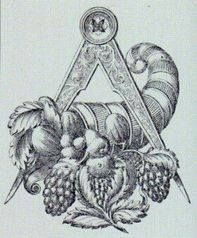 In former times, such superficial Freemasons were held by many in high repute because of the facility with which they passed through the ceremonies of a reception, and they were generally designated as Bright Masons. But, the progress of Freemasonry as a science now requires something more than a mere knowledge of the lectures to constitute a Masonic scholar. "...Mackey's Revised Encyclopedia of Freemasonry, Vol. 2, Page 752, Albert Gallatin Mackey, 33 ̊, published by The Masonic History Company, Revised ed. copyright 1929, Original copyright 1873. The message that I retained from this excerpt is that Masonry is a life long journey of learning. It takes patience, a willingness to learn, an open mind and an open heart. We learn the rituals and ceremonies as a foundation in which to build upon as we learn more during our journey to become “Bright Masons”. These representations of the teachings are there to encourage the brethren to find out more and to encourage us to dig deeper not only into the intricacies of Masonry, but in our own lives as well. They encourage us to think critically about our life decisions and they help us navigate our social interactions and life events. A “Parrot Mason” in my opinion, is not a bad thing. To me, it is simply the first step in understanding Free- masonry. Just a child learns a language by repeating the sounds they hear, and then learns the meaning of those sounds, we as Masons learn the language of Freemasonry by first learning the rituals. These are doors we are invited to walk through. Not eve- ryone walks through those doors at the same time, and not everyone will retain the same knowledge or understanding as everyone else. We are all unique, and we are all at different phases in our lives that subject us to different perspectives, even when re- flecting on the same idea, and I think that is okay. Our differing perspectives and knowledge bases provide opportunities for everyone in the lodge to both learn from each other and teach others around us. I encourage everyone to join us in October and witness the hard work put in by the degree team, and to think critically about the words that are said during the degree. Not in an effort to memorize them, but in effort to understand them. This month I want all the Brethren to focus on the fact that St. John’s Lodge No. 11 is an entity that we are all equally apart of and are responsible for its health. Everyone’s voice in the Lodge has equal importance and carries the same weight, no matter your position in the Lodge. Whether you sit in the East, the comfy chairs in the North, or on the sidelines, your voice and engagement matters to the Lodge. This is a time in our society where we are constantly being bombarded with stories about inequalities, injustices, and down-right hate, but Freemasonry is a wonderful organization that seeks to advocate for harmony, peace, love, and togetherness. Now, this bulletin entry will not be used to make some sort of political statement about our current societal affairs, but it will be used to remind each one of you that when we meet in Lodge, as Brothers, we are acting out the way in which we believe the world should operate, and that means as a group of dedicated men who are interested in pursuing and living a life based on acceptance and openness. We can’t solve the world’s problems in our Lodge room; but we can carry a message of peace and the willingness to work together out there in the world. Harmony, being the strength of this institution, represents that above all else we care about – being harmonious with each other inside and outside the Lodge room, as well as harmonious with Brothers and non-Masons alike. Based on those reminders of who and what we represent, I implore you all to engage in your Lodge! This is our Lodge! Based on creating a will to do something, this Lodge can, in fact, do what it wants to do. All it is lacking are the people to carry out its business. We all have different ideas about how we would like our Masonic experience to be, but, unless you are there and engaged, that vision is never brought to fruition. There are important events coming up in the final half of the year. One of which is the conferral of the Master Mason Degree Ceremony in October. This cannot be done without practice! I repeat it cannot be done without practice! That does not mean those who do not have parts are not involved. Every- one’s engagement enhances the experience, it enhances Lodge harmony, and it breeds fellowship. The more prepared we are as a group demonstrates our Lodge’s ability to work together and produce quality events and ceremonies to newly raised brethren. Ceremonies that these Brothers will remember for the rest of their lives (when we make it special)! Another important event is the Fall Fellow Craft Brunch scheduled for Saturday, September 23rd. As most of the readers of this are aware, those brunches determine a lot regarding which direction the lodge takes in the next year. If you are feeling disengaged because you don’t like the way things go in our lodge, or perhaps the lodge doesn’t interest you with our activities and meetings, this brunch be- comes your most effective tool for implementing positive changes moving forward. It allows us to have candid conversations about ways we can get our brethren excited about being a member of St. John’s Lodge No. 11 and also being a Freemason in general. There is no better time than now to get our Lodge’s heart pumping again and get people excited. To do this we must all communicate, talk, debate, engage, plan, attend events, participate in rituals, visit other lodges, visualize positive changes and execute them! I continue to look forward to growing with you all through Masonry. I hope everyone has been enjoying their summer so far and have managed to stay cool on these hot days. As we take these summer days to relax with our friends and families and enjoy the beautiful holidays and fun summer parties, we begin to look towards fall and winter and getting back to busi- ness. Our July break marked the half-way point of the year, and, I must admit, it feels like it is flying by. I’ve enjoyed being in the East thus far and have really enjoyed seeing everyone continue to develop and take pride in their Lodge. We still have many important meetings in the second half of the year, and I hope everyone can come out and help us continue to grow, both as a Lodge and as Masons. I wanted to quickly share about my experience walking in the National Mall Independence Day Parade that took place on the Fourth of July. My son and I met up with Masons from across the jurisdiction and marched under the title of the Grand Lodge of the District of Columbia. We carried a large inflated American Flag balloon that may have gotten away from us once or twice, but, as we know, overcoming struggle brings folks closer together. It was a great bonding experience, and I got to meet many Broth- ers from different lodges. Although it was hot, we were provided plenty of water, and it was fun walk- ing in the parade, being part of the balloon inflation phase, and watching the other balloons being in- flated and correctly oriented. This was a much more rewarding experience as opposed to sitting on the sidelines. I felt proud to be an American and proud to be representing such a patriotic community, Free And Accepted Masons of DC. Also, during the Fourth weekend, my son and I attended a fireworks show that was held at George Washington’s home, Mt. Vernon. This was a ticketed event which made for a slightly more intimate viewing of the fireworks overlooking the Potomac River. Our Illustrious Brother George Washington and his wife Martha made an appearance and spoke to the group for about 10 minutes prior to the fire- work show from his back patio. They spoke about the Revolutionary War and how they were spending those days in July back in 1774-76. We also took a tour of the Mansion and grounds. If you have not been to Washington’s Mansion and Mt. Vernon, I highly recommend it. Being a Mason, I felt proud and a part of Washington’s legacy. The ideals he fought for are still relevant today, and we, as Masons, are carrying on his legacy every day through the men we are in society and in our homes with our fami- lies. I am looking forward to seeing everyone in at the St. John’s lodge family picnic and the next stated communication. May has been a busy Masonic month so far, and luckily (or not so luckily depending on your preference) the warm weather looks like it finally might be here to stay. First and foremost, earlier this month at St. John’s we had our annual Grand Lodge Visitation. Most Worshipful Grand Master Roman Volsky and the officers of the Grand Lodge came and sat in our Lodge to discuss some of the activities and events the Grand Lodge will be conducting this year, as well as hearing my Master’s report about the status and progress of our Lodge for the 2017 Masonic year. I would recommend that each brother visit the Grand Lodge website and fill out the registration forms for the Universal Brotherhood Weekend activities as well as the Fourth of July Parade activities and other events they are offering now. I’ll be marching in the National Mall parade with my son, and I encourage you all to sign up and get out there with your families. Secondly, the Pillar Officers attended the Grand Lodge Semi-Annual Communication to listen to some proposed Grand Lodge legislation, hear committee reports, and vote on some legislation that focused on providing lodges with the flexibility they need to retain and bring back some brothers the Lodge may have lost due to non-payment of dues (NPD). The Grand Lodge has developed a program that allows for members who are delinquent on dues payments an easier path to rejoining the lodge. The information about this program is attached separately. Please read it and inform other Brothers about it. We will also discuss it in the June stated. Additional legislation involved some information technology issues and privacy issues that the Grand Lodge has been working on resolving. The Grand View website (different than the Grand Lodge website) has seemed to resolve most of the privacy concerns on the members. Our Worshipful Brother Anand Trivedi will be conducting a tutorial at the June stated of the Grand View website. Please attend this meeting as we will discuss how this website will really change the way DC Masons communicate and organize. Thirdly, a couple of us from St. John’s visited Hiram Takoma Lodge No. 10 as they performed a courtesy degree for two of our own Brothers who have now been passed to the degree of Fellowcraft. I hope everyone has an opportunity to congratulate our Brothers Colin Timbers and Jeff Doctor who went through that Fellowcraft degree and help them grow in Masonry and extend their understanding of receiving more light in Masonry. While at the meeting we began discussing some joint meetings and events with Hiram Takoma Lodge, and we look forward to those discussions continuing and getting some events on the schedule. I will inform the Lodge of some concrete ideas as they become available. Looking forward to seeing everyone in June and updating the brethren on all the new developments happening in our jurisdiction. I hope this spring weather has brought you and your family joy, and I hope you’ve been able to be outside in the beautiful weather without pollen allergies swiping the fun away. Additionally, I hope those of you that attended the George Washington Masonic Memorial Tour and Family Appreciation Luncheon enjoyed your morning and afternoon. I would like to thank everyone who attended and the invited guests that were there. I would also like to thank Brother Junior Warden for organizing the event. This event is always a great way to introduce interested men and their families to this wonderful organization and was another success. In my research I came across some writings regarding a symbol brought to our attention as Entered Apprentices. The Cable Tow is a symbol often referenced in Masonic discourse but is rarely defined. I came across many different interpretations of the Cable Tow, most of which were outlined in the informative publication “The Builder”. Below is an excerpt from one of the magazine’s monthly submissions from 1923. In my opinion, the excerpt below succinctly articulates what the cable tow is and how we should think about its meaning. The Cable Tow is symbolically removed to represent this control and the ability to govern ourselves. The oath which binds us all helps us to maintain this moral governance. Our Cable Tow represents our individual link to the Fraternity as a whole, and also the Fraternity’s link to each and every Brother. It is what keeps us all connected and there for each other. A wonderfully important symbol and lesson to keep at the forefront of our minds. Brethren, please take due notice that our Grand Visitation is happening at the May Stated Communication. Please do everything within the length of your cable tow to attend. The Grand Lodge has been noticing our growth over the years and we would like to continue that sentiment. Looking forward to seeing you all in May!